What most people don’t realize about RTA cabinets, no matter how good they are, is that they also come with replacement parts. These parts are often interchangeable, with standard sizes, so if you went with stable and cost-effective RTA cabinets originally, congratulations! You will be able to order those doors and drawer faces and install them very easily. Even if you went with custom, chances are there will be the size of door that you need which will go on your cabinets with little to no modification. A growing trend we see here at RTA Cabinet Store is to mix and match styles of base cabinets with different doors. This can bring a fresh, updated look to your bathroom, without the expense or time of a complete remodel. Jump on the website and ask one of the cabinet experts there for help. They would be happy to give you suggestions and ideas, whether you want to try to match the original cabinets as closely as possible, or create a fresh and unique look by mixing and matching. One thing that you will have to be careful about is to get the right type of cabinet door. Be sure that you are looking in the bathroom replacement parts or styles, rather than kitchen doors. They might fit and look great, but bathroom cabinets are usually treated to withstand high humidity. You don’t want to get your new doors on and find out six months later that they are warped! You would be right back where you started. Of course, some people do this exact thing, without consulting our experts, and while there are sometimes complaints, the vast majority of people either naturally look for these replacement parts in the right area, or are directed there by our experts. Check out some of our reviews at Houzz for RTA Cabinet Store. 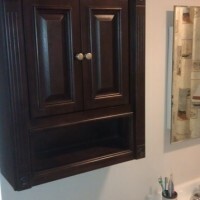 http://www.houzz.com/photos/query/rta-cabinet-store . They can also be useful for giving you an idea of how to design your new bathroom look, as the vast majority of the reviewers are proud of their new kitchen or bathroom, and include pictures to show it off.